"This week, Year 3 have been learning all about fractions. 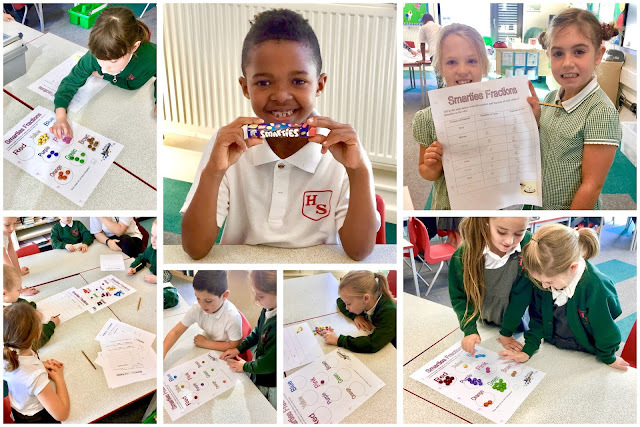 They thought of a wonderful way to put their knowledge into practice: finding fractions of a packet of Smarties. The children thoroughly enjoyed, sorting, representing the Smarties as fractions and finally eating their resources." Our marvellous mathematicians calculated the fractions of a group of objects by sorting the Smarties into colours. Then, they answered questions about the data they had collected. The children were able to apply their knowledge to a real life situation to prove they are Fraction Smarties!